Prison reform campaigners say that a South West jail criticised in a report is struggling with overcrowding. Inspectors criticised a lack of meaningful activities at Exeter Prison and said inmates spent too much time locked up. But the prison was also found to be among the best in the country at helping rehabilitate offenders. The Prison Reform Trust said it showed that Exeter, which was designed for 316 inmates, but has 531, was overcrowded. 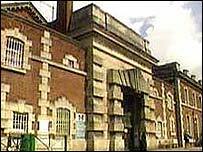 It said in a statement: "Until, and unless, this overcrowded Victorian local jail is reserved for serious and violent offenders and the South West courts have an adequate range of community penalties, bail accommodation, drug treatment and mental health care disposals from which to chose, then it is pie in the sky to expect Exeter prison to do its job to prevent re-offending." A number of schemes to help prisoners when they first arrive and are most at risk of suicide were praised by inspectors. But there are still sanitation problems in one wing which mean inmates having to slop out in the mornings. Inspectors commended a scheme led by prisoners to help inmates off drugs and develop the skills they need to find a job when they return to the community. Prison governor Ian Mulholland said it was a fair criticism which would be addressed.